The Christmas period is always one of great stress and pressure for the delivery sector. With Royal Mail’s hold over the industry beginning to be threatened, I can use YouGov BrandIndex data to assess how it has been performing in the run up this crucial time. Of course, Royal Mail has been repeatedly in the news this year as the controversy over the privatisation move refuses to go away. Its financial announcement revealed a year-on-year profits fall of 21%. It has also seen new entrants to the market make expansion plans. Amazon has set up a delivery business in its own right and become a competitor, grabbing 2-3% of the UK parcel market. This has exacerbated the pressure the company is already feeling from challenge service Whistl (formerly TNT). 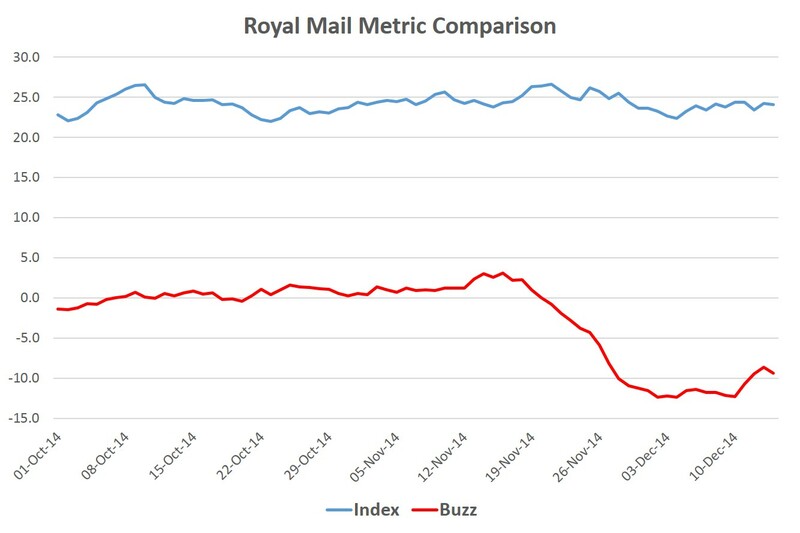 A look at YouGov’s Buzz Score Metric tells the story of the negative press that Royal Mail has encountered in the last few months. Their score has decreased sharply since the middle of November. At that time their rating was +3.0 and that fell to low of -12.4 at the beginning of December. It is now at -9.4. The steep drop can possibly be explained by the warning put forward by the company that the ability to deliver anywhere in the country six days a week could potentially be under threat, particularly in rural areas. Of course, the universal service obligation is seen as essential by most people. However, Royal Mail’s claim was labelled by the business secretary Vince Cable, as ‘scaremongering’. There does however, still appear to be a good deal of appreciation of the service offered by Royal Mail. Their Index score (which is made up of a variety of metrics such as value, quality, satisfaction, reputation) shows a good level of resilience, averaging a solid +24.3 since the beginning of October. This signals that although the brand may be dogged by occasional bad new and controversy, the overall image remains strong. The issue remains, how will Royal Mail respond to increased competition? And is it the case that a break in its monopoly will lead to reduced prices and a continuation of a six day service? With a move to provide a service on a Sunday being muted, it is clear the industry is in the early stage of a transformation.